To stand and look at the Sandwich Notch Road today it is hard to picture it as a major artery of commerce. But in its heyday, in the first decades of the nineteenth century it was an interstate highway of the time allowing farmers and craftsmen from Vermont and northwestern New Hampshire a shortcut to tidewater at Dover and Portsmouth for their goods and wares. And then as quickly as Notch community sprung up it was gone, left for greener pastures. By 1860 there were only eight families left in the Notch, by the turn of the twentieth century only one person lived here. The land reverted back to wilderness broken only by the gravel ribbon of the Sandwich Notch Road. The route was laid out in 1803 and constructed in succeeding years, built by manpower with oxen and horses providing the heavy labor. When completed, it provided a shortcut from the Pemigewassit River Valley to the route to the seacoast. Farmers and tradesmen transported their goods in the winter mainly as the snow packed road was at its smoothest then. They would bring meats, hides, tallow, bark, syrup and apples, among other things to trade for home goods they could not grow or manufacture such as sugar, tea, rum, salt and molasses. The Sandwich Notch Road is unique in New Hampshire in that it actually crosses two notches and three watersheds serving two of the great river systems of New England. In the west or south these are called passes or gaps but in New England the terminology notch was adopted due to their physical appearance when seen from a distance due to glacial scouring. 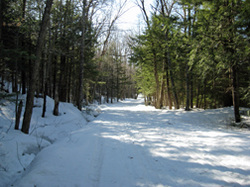 The first notch, between Mount Israel and the Squam Mountains, is crossed at about 2.3 miles from the start of the road. It divides the Bearcamp River watershed, which flows eventually into the Saco River and empties into the Atlantic Ocean in Saco, ME, and the Beebe River watershed which flows into the Pemigewassit River and joins the Winnipesaukee River in Franklin, NH to form the Merrimack River which reaches the Atlantic in Newburyport, MA. 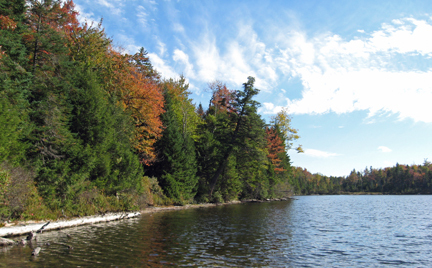 The second notch, and the higher of the two, is crossed at about 5 miles and is between Sandwich Dome and Mount Weetamoo and divides the Beebe River watershed and the Mad River watershed which both flow into the Pemigewassit River. At its height in the first decades of the nineteenth century the Notch supported thirty to forty families on small rugged hill farms. As you drive the road today the stonewalls and cellar holes are evidence of this hard scrabble existence. In addition to its residents, the Notch was home to two sawmills, two schoolhouses and a still. By 1860 the lure of easier and better farmlands had called away most of the residents and there were only eight families in the Notch. 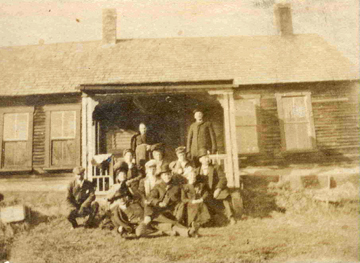 By the first decade of the twentieth century Moses Hall, the last resident of the Notch, was the only one left. The Hall Place, a private residence, is the only house left on the Notch Road. After the families had left, the land sat empty for many years until bought up by the lumber companies and in the early twentieth century a logging railroad was constructed up the Beebe River valley from Campton to Flat Mountain Pond in Waterville Valley to get the trees out to the mills. 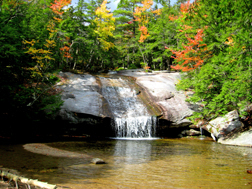 In the 1930's and 40's the tracks were taken up and a portion of the land was sold to the White Mountain National Forest. In the 1980's a campaign to "Save the Notch" was successful and led the owner to sell most of the remainder of the land to the National Forest and today the entire length of the road is along protected private property and local and federal government land. This narrative can only give you highlights of the long and interesting history of the Notch community and the Notch Road. For a complete history of the people and customs of the Notch the 1935 and 1988 Annual Excursion Bulletins of the Sandwich Historical Society are available for purchase on this site or at the museum. The Notch Road is a one lane gravel road and is generally only open from May until late November depending on the weather and road conditions. It is closed at all other times and in the winter is a major snowmachine trail. It should only by traveled by vehicles with high ground clearance. There are no services or phones available on the road and cell service is exceptionally poor. The road can be driven easily in an hour, but slow down and enjoy the scenery. ﻿ Start from the blinking light in Center Sandwich. (Don't worry, there's only one in Town.) 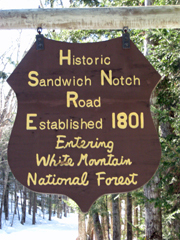 Look for a black and white sign that will point you towards "Sandwich Notch" and "Mead Base". Take Grove Street and stay straight as it turns into Diamond Ledge Road. In 2.4 miles Sandwich Notch Road bears to the left. At .75 miles on the left is the parking lot for Sandwich Notch Park. A short distance down the Bearcamp River Trail are the Beede Falls as the Bearcamp descends over a series of ledges. A pleasant hour's walk can be had by following the Bearcamp River Trail past Cow Cave to Mead Conservation Center and then following the Diamond Ledge Road and the Notch Road back to your vehicle. At 1.4 miles on the right between the two bridges is Pulpit Rock where Joseph Meader, a Quaker minister, would preach to the Notch residents on the Sabbath Day. At 2.2 miles on the left are the Devil's Footprints, a series of small glacial potholes in the ledge that look like, yes, footprints. Across the road, under an overhanging projection in the ledge, is what has to be one of the oldest extant billboards in the United States. 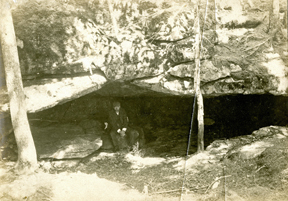 "P. Wentworth 6mls 1838" is chiseled into the rock to let passing teamsters know that Paul Wentworth's store was six miles ahead at Lower Corner. At 3.0 miles cross Beebe River and come to a crossroad. This is the old railbed of the logging railroad from Campton to Flat Mountain Pond. On the left just past the crossroad and down the power line is visible probably one of the last native apple tree left from the original settlers. At 4.6 miles on the left is the Hall Place. Still a private residence, it is the last house in the Notch. At 5.5 miles on the left is a rough gated road that leads in a half mile to Upper Hall Pond a scenic tarn tucked into the surrounding hills. At about 7 miles cross the Sandwich-Thornton town line. In another mile come out into open fields with a beautiful view of the Mad River Valley and the Sandwich Range. Another mile will bring you to Route 49 in Thornton.